Want to Make Black Friday Shopping Easier? With Thanksgiving just in a few days, you know what is just around the corner-Black Friday. Even if you have never been out to face the cold, crowds, and good deals, I am sure you have heard your fair share of stories. Of course, you hear the stories of people getting all their Christmas shopping done in day, or getting that new TV for a very low price, but there are also the stories of people waiting in line for HOURS or getting trampled when the doors open. Some people are HUGE Black Friday shoppers; they have everything mapped and timed out to every little detail. They plan to hit each store as soon as it opens and have a planned routine to get in and out as quickily and painlessly as possible. Back in the day, people would have to wait for the Thursday paper or even if they are lucky, the weekend before to find out about all the hottest deals from each store. Nowadays, some ads for these stores were printed in OCTOBER and posted on the internet for all to see. It is ridiculous how one person can get a hold of a sacred ad and have hundreds of thousands of people view the ad before it has even come out. Personally, I am going to do a little bit of Black Friday shopping and I have not picked up a tangible ad for any of the stores yet, and I don’t plan to. At the end of October I got to see the ad I wanted without having to wait until this Thursday. It’s so convenient to use the scanned ads that are already available online. I just Google “Target Black Friday” and like magic, hundreds of results of the scanned Target ad for Friday will pop up. This gets even better when you follow a popular forum. A Forum is simply “a public meeting or assembly for open discussion”. The online forums that I follow are made up of thousands of Savvy Shoppers. One of my favorite forums, slickdeals.net, has a “Black Friday” section where you can view the ad for almost any store you wish, plus because so many people are involved in a forum, people have posted coupon match ups and advice to match your deals even better. Slickdeals uses a Wiki at the beginning of every forum, where all the deals are entered and coupons and rebates are added. Anyone who is a member of the forum can add and erase coupons to keep it updated. It’s amazing to me how much work is eliminated out of your Holiday shopping by using online ads and coupon match ups. Forums are a great way to get accurate information because they are collaborative and can be constantly updated. One last note, there is also an app for iPhones/touches/pads, called “GottaDeal”. They also have a Black Friday section, but now you can view the deals and plan your Friday all on your handheld device. https://i1.wp.com/savvywifehappylife.com/wp-content/uploads/2010/11/black-friday.jpg?fit=1024%2C768&ssl=1 768 1024 Brandi https://savvywifehappylife.com/wp-content/uploads/2016/09/SavvyWifeHappyLife-logo-2.png Brandi2010-11-22 23:26:312010-11-23 03:20:07Want to Make Black Friday Shopping Easier? This weekend, my boy friend and I went to Giant to pick up a few things for his sister’s birthday party, and being the adventurous shoppers we are (I take him along with me to get all my crazy deals), we decided to use the “Scan It!”. This new device is located as soon as you walk through the doors at the “Scan It!” station, where many handheld scanners await a daring shopper to try them out. 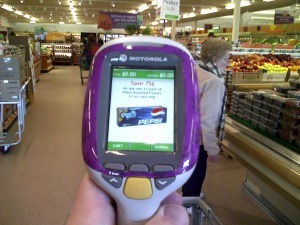 These special handheld scanners are linked to the store’s central computer system, eliminating the need to wait in line for a cashier to check you out. So, he typed in his phone number to the machine since we didn’t have the Bonus Card, a scanner lit up, signifying that it was ours to take and we were on our way. If you didn’t bring your reusable bags with you, you can grab a few paper or plastic bags when you grab your scanner. We went to the candy aisle and grabbed a pack a gummy worms, scanned it with our handheld device, the price and new total showed up on the screen, and then we put the candy into the bag. To buy fruits and veggies, there are new devices in the produce section that allow you to select the type of produce you are purchasing and then it takes into consideration the weight or quantity and spits out a barcode sticker to put on your bag of fruit or veggies. This makes it so simple to scan your own produce with your handheld scanner. After all the shopping was complete, we took the scanner and our groceries (already bagged) to the Self-Checkout registers. We scanned the barcode near the register that says “End of Purchase Barcode”, typed the phone number in again, and magically all our purchases were on the screen in front of us. At this time you can scan coupons and then pay. You place your handheld scanner in one of the docks by the register and you are free to leave. I love Giant’s new “Scan It!” technology, it saves time and money. In the future, all grocery stores will probably use this technology because it eliminates the need for all those cashiers and baggers, which would save the store a lot of money. It’s amazing to think about the effects of computers and media, but who would have thought it would affect your grocery shopping? A simple task of buying food now transformed into this new digital era; my mom and grandmother still haven’t gotten the hang of the self-checkout. Smile.ly: Be heard, Be happy. Just recently I joined the site called Smile.ly after one of the blogs I follow suggested it. Smile.ly is the world’s first social media powered community designed to bring you new things to try and share. Basically, they are a company that sends its participants products to sample for free and ask that you simply share the product and/or your opinions of it. Smile.ly’s motto is “Be heard. Be happy. Join Smile.ly. Experience new products. Share you thoughts with the world.” After trying the product they send, you can Tweet about how great it is and let your Facebook friends know about the product via their Facebook and Twitter connections. All you need to do is click “Share Now” and all your friends will know about the product instantly. This sites mission is to use people to spread the word about products, and what a great tool Facebook and Twitter are to do just that. Hypothetically, Smile.ly users will receive their free products, tell their friends, tweet about it and connect via Facebook and then your friends will tell their friends about the product and the companies will flourish. On their site, Smile.ly says “In a nutshell, Smile.ly is a network of consumers. Our consumers participate in our social media programs and receive different products and services. They talk—the world listens.” You get brand new products to try and give your honest opinions to your friends. Doing more “missions” (simply trying a product and sharing your opinions) raises your status on the site and makes you eligible to receive more and better products to try. Smile.ly gives you something to talk about on your social networks and the ability to share your findings. Smile.ly LOVES social networking and believes it is the new way to get products heard so affectively. With millions of users on all the social networking sites, news travels far and fast. On the Smile.ly site there is the same “chat” options that you will find on Facebook. You can see how many people are online and talk to them in a group or private chat, eliminating the need of customer service sometimes because people help each other. If you are into trying new, free products and don’t mind voicing your opinion after you try it, then I highly recommended signing up for Smile.ly. I signed up less than two weeks ago and I’m awaiting three different products to try in the mail. Right now, while supplies last, females between the ages of 14 and 25 will receive a free Schick® Quattro Razor for Women. https://i2.wp.com/savvywifehappylife.com/wp-content/uploads/2010/11/SMILE.LY_.png?fit=914%2C414&ssl=1 414 914 Brandi https://savvywifehappylife.com/wp-content/uploads/2016/09/SavvyWifeHappyLife-logo-2.png Brandi2010-11-08 03:40:392010-11-23 03:22:58Smile.ly: Be heard, Be happy. Is it safe to give out your information so freely? With all these free samples and coupons deals you may be leery about constantly giving out your contact information. Do you think it is risky to provide your name, mailing address, and email address to all these companies? I feel that if you are requesting samples and coupons form legitimate sites, ones that are from brands we know or other trusted companies that people recommended, that it is safe. Many of your addresses can be accessed anyway through search engines and the phone book. There is the risk of identity thieves if you provide your information to an illegitimate source, so you must be careful and use common sense. I have been requesting samples for quite sometime and I have not had any problems and I have had very little “junk” mail at my address. With that being said, never give out your social security number or credit card information unless you are positive the site is fully secure. Of course, there can be awful identify crises when people give out this sort of information. The tracking on computers has become so advanced that you need to be careful when giving personal information out because you never know where it can end up. I recommend that you set up a junk email address and use it when you sign up for freebies and such. You will gets tons of junk mail and spam at your email, so do not use your everyday one. It is free to make an email with many accounts, like Gmail and Yahoo, anyway. Many free samples and coupons are also given away through Facebook. Many people are leery signing up for them through their Facebook account, especially when it says “This app/company/etc. wants access to your name/age/friends/etc.”, and to get the samples and coupons, you must press “allow”. In this case, only allow it if you have a strong privacy setting set on your Facebook account. Again, if it is an legitimate site you shouldn’t have to worry about any thieves or spam, but just be warned. Also, when signing up for things, always fill out as little information you need to. If your phone number isn’t required, don’t put it. All this new media is making it too easy for people to put all their information, including addresses, names, and pictures, out for anyone to see and use. In the end, just be careful where you put your information and who you are giving it to. I think this new media is great for many reasons, especially for all these freebies and coupons, but just use your best judgement when signing up for things. https://i0.wp.com/savvywifehappylife.com/wp-content/uploads/2010/11/junk-mail.jpg?fit=1825%2C1909&ssl=1 1909 1825 Brandi https://savvywifehappylife.com/wp-content/uploads/2016/09/SavvyWifeHappyLife-logo-2.png Brandi2010-11-02 00:35:362010-11-11 14:40:37Is it safe to give out your information so freely?